I've got a couple birthday gifts to buy and one of them is going to have to be this Seiko Kinetic Chronograph. The Arctura watch is normally priced at $799.99 but for one day only at 1SaleADay, it can be had for just $149.99. 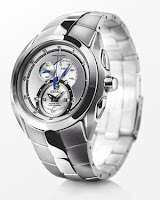 Seiko Men’s Kinetic Chronograph combines Kinetic quartz accuracy with ingenious traditional watchmaking. This ultra-modern watch is slick and stylish and runs on the most advanced technology. It uses kinetic movements, so it never needs a battery. Instead, it uses the wearer's natural arm motion to generate electricity and store it for up to five months in a power reserve capacitor that powers the watch – even if it’s sitting on a shelf. It is a once in a lifetime deal. And it only lasts a day. A great quality watch with buttloads of features for 79% Off the regular price. The clock ticks so hurry over to 1SaleADay.com.